Isles of Scilly Wildflower Of The Week - Prickly Sow-Thistle. This week's Isles of Scilly Wildflower Of The Week was Prickly Sow-Thistle - Sonchus Oleraceas. Prickly sow-thistle is found on all the inhabited islands and larger uninhabited islands. 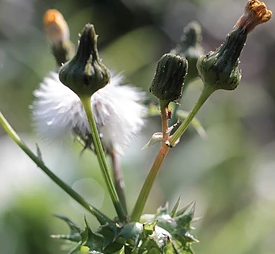 Its close relative, the Smooth sow-thistle, is also found in all these locations. Both plants are very common both here and on the mainland. Prickly sow-thistle is a tall robust plant with many deep golden smallish yellow dandelion flowers. The buds form a teardrop. The seedheads are very fluffy, again like dandelions. The flower heads do have an unfortunate habit of closing on the seeds so very tatty tufts stick out. The leaves are very prickly, so easy to distinguish from the only slightly spiky Smooth sow-thistle leaves. Think elongated Holly with a back bending curl and spines in different directions. The botanical name, Sonchus Oleraceas, means a sow-thistle that can be used as a vegetable or herb. The Sow-Thistles are pollinated by insects, who visit for the the nectar, and the seeds are wind dispersed. An old name for Prickly Sow-Thistle is Hare's palace as it was used by the Hare as a shelter.